The Boston Bruins find themselves trailing to the Toronto Maple Leafs 2-1 after Game 3. The Leafs were able to pull even after the first two games played at TD Garden and won Game 3 at home. They have the home-ice advantage now and the Bruins are in a must-win position headed to Game 4. If they still want to make the second round of the playoffs, the B’s need to win on the road at least once. Game 1 was not good enough. The Bruins didn’t play that badly, but they made key mistakes in the important moments of the game. The Leafs managed to capitalize on those offered opportunities and took Game 1. In Game 2, the Bruins knew they need a huge response and they got what they sought for. Boston showed that its team is very tough to beat if they are playing like in that Game 2. But the performance from Game 2 hasn’t shown up on the road for Game 3. 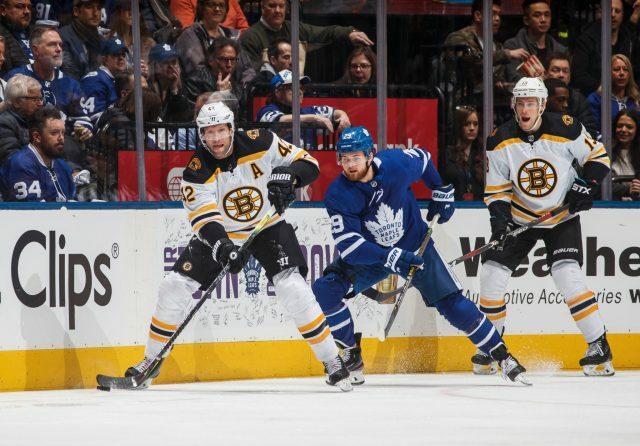 It’s certainly not about hitting the panic button; the Bruins came into Toronto needing just one win, and that win can still be accomplished. Even though the Maple Leafs outplayed the B’s in Game 3, it was a tight one after all. After the Bruins held a perfect four-for-four on the penalty kill in Boston, they gave up two goals on three Leafs power-plays Monday night. At even strength, it was not good enough from the Bruins either. First line production at even strength is something the Bruins lack. In Game 2, they got one goal from their top line, when David Pastrnak gloved the puck down after a miscue from the Leafs defense and found Brad Marchand, who beat Frederik Andersen five-hole. That’s it from the top line’s production at even strength so far. We have seen the Leafs’ top line with John Tavares and Mitch Marner producing only one goal 5-on-5 as well. But one would think that Mike Babcock doesn’t expect Tavares to score a hat trick each game. He expects him to shut Bergeron’s line down. So far, Tavares has done that and the Bruins are hurting from it. In Game 3, they got a goal from David Krejci, who also had another golden opportunity near the end of the game. Then the B’s got yet another goal from Charlie Coyle, his second in two games the third overall for the third line in the series. Bergeron, Marchand, and Pastrnak generated two power-play goals along with the aforementioned Marchand tally in the first two games in Boston. After the production from the second and third offensive lines, the big hole for the Bruins has been the top guns, thought to be the strength of the team. David Pastrnak, so good against the Leafs last year around, has just one assist in three games now. He is not getting his shots and is visibly frustrated. In his three games in this series, Pastrnak is 54-46 in Corsi at even strength, which is not great. His expected goals against is at 2.23 versus 1.60 in expected goals for. In Game 3, his linemate Bergeron had 0.48 at xGF and 0.56 at xGA, while Marchand had 0.61 at xGF and 0.59 xGA. Their even strength opposition in John Tavares had the xGF at 0.72 and xGA at 0.46. If you are not familiar with these stats, it just reflects how John Tavares has been able to successfully shut down the Bruins top offensive line. Despite this shutdown, they got their looks on the power play in the first two games. In Game 3, the Bruins had three man-advantage chances and the first PP unit looked awful on each of those. The Bruins fans were happy that Auston Matthews has been kept quiet at TD Garden, but now he has a goal and David Pastrnak, who had four tallies and nine points already last year in three games, is still waiting for his first playoff goal during the series. The Bruins need a huge win in Game 4 on Wednesday. Their top offensive unit has to play lights out compared to Game 3 and the beginning of the series if they have any chance of beating their northern rivals.